Thank You To Our 2018 Gallery Wall Painters! Up until September 2018, the Blackstone Valley Art Association Alternatives Uxbridge Gallery had no hanging system. That meant that every time a show was hung, actual metal nails were hammered into the walls. This was, as you might imagine, awful for the historic brick walls. We were chipping away at the mortar. It was also less than ideal for the regular walls, as they were getting peppered with holes and marks. On Friday, August 31st and Saturday, September 1st, 2018, a team of BVAA members came together to do an incredible painting project. The opening reception for our Show of Hands show was only a week away – on Friday, September 7th. That meant we had to get the existing walls cleaned, spackled, painted with two coats of paint, and dried. Next, the hanging system had to be brought in and be installed. And then we had to hang the show. With enthusiastic cooperation and great team spirit, it was all done! Now the compliments pour in on how wonderful the gallery looks. For those who are curious, the Uxbridge gallery was painted London Fog grey. We used an eggshell finish on the walls and a semi-gloss finish on the ledges, frames, and doors. Rick Benjamin – did all the spackling himself! Thanks to Alternatives Property Services Team for jumping in and coordinating the time to get the hanging system done, and to the installers, Leo and Jason, for installing the hanging system with a smile! And a warm thank-you to the STAS Hanging System group, which are located right nearby in Millbury, for giving us a discount on their amazing hanging system. We also want to thank the Uxbridge Cultural Council, who gave us a grant in 2017 to start the testing of the hanging system project. That initial section gave us the feedback and experience we needed in order to do the entire room. Did we miss anybody? Please let us know! With the hanging system now in place, so no more nails have to be used, this paint job should last us for years and years! It’ll also make hanging shows and adjusting shows far easier. Here’s an image that showcases the hanging system on both the brick and the regular-wall surfaces. 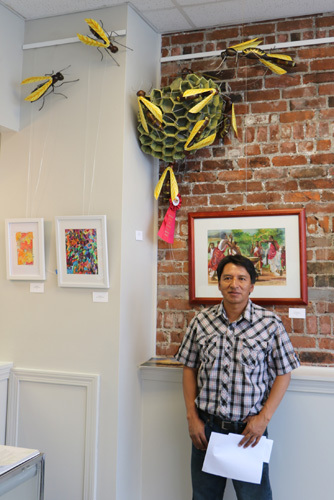 It features Jose Criollo with his amazing Wasp Hive sculpture. We’d love to have you come out and visit us!